The attic and crawl space is rarely visited by homeowners, so damage occurring in these functional areas continues unabated until a serious issue emerges. In such a scenario you’re looking at a huge outflow of funds to deal with costly repairs to the property. Timely inspections and proper maintenance is vital for monitoring and addressing longstanding issues in the attic and crawl spaces. We at Quartz Solutions, are a team of skilled professionals equipped with the latest techniques to do the job right and with a full guarantee. If ignored the attic and crawl space presents a conducive environment for a range of problems that can impact the health of your family and dramatically lower the real estate value. Excessive moisture can breed mold and mildew that can impact the quality of indoor air. It also triggers structural damage due to wood rot and corrosion, resulting in households shelling hefty sums for maintenance. 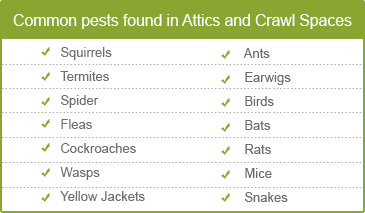 The presence of insects like fleas, spiders, wasps, roaches and termites can become a menace. Not you’re most welcomed house guests! Animals like rats, raccoons and squirrels can cause substantial damage by chewing right through vents, cables, wires, ducts, plumbing system and more. What’s worse they leave behind waste that creates a stench. Dripping ducts and damaged insulation will negatively effect utility bills, besides spreading harmful germs through your living space. Being able to gauge the issues in time can save a major headache, hence, a meticulous evaluation of attic and crawl space, including testing for radon gas is a top priority. Our dedicated workforce at Quartz Solutions will visit your premises for a free analysis of the existing and impending problems. The experts will then explain how to eradicate the issues at hand in a cost effective manner using the best products and latest techniques. We at Quartz Solutions maintain the highest level of professional standards and take pride in giving our clients the best quality service at very competitive rates. Harrison in Hudson County NJ, situated across the Passaic River offers its residents a friendly, diverse and safe community. The town with wood-frame houses on quiet streets is in the midst of a major re-development. We would love to be a part of this growing process. 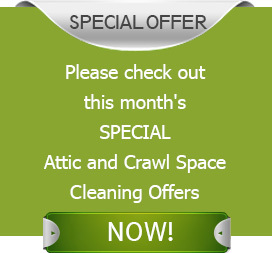 Give us an opportunity to help maintain of your attic and crawl spaces. You can count on us to keep the property in A-level condition. Call Quartz Solutions today at 201-205-2042 to avail a free inspection!